People who stream video games is increasing each and every day, which means gaming chair companies such as DXRacer, OPSeat, Vertagear and others are making a killing trying to keep up with demand. I’ve had the pleasure of reviewing chairs from each of the companies listed above, and today I’m taking an in-depth look at another gaming chair company called EWin Gaming Chair as they have sent me their EWin Racing Flash Series XL gaming chair over to me to play around with. My first impression of this was the larger than life sized box that appeared on my front door step. Following this came the weight of the package, which prompts a small safety warning to lift with your knees not your back. There is an old saying that weight usually goes hand and hand with the quality of product, which I am hoping to be true about the EWin Racing gaming chair. EWin Racing took the high ground with their packaging, offering a cardboard box that was actually meant to contain the chair as well as bumps and bruises it may encounter during shipping. Once I started pulling various chair pieces out of the box I realized that EWin Racing had sent me a really HUGE gaming chair. In fact, their Flash XL Series seems to be the biggest chair they sell. At first I thought it was going to be a bit too big for me, even though I am a bigger guy, it just looked way too big. Only a bit of time in testing it and sitting in it would really tell if it was too big or not. 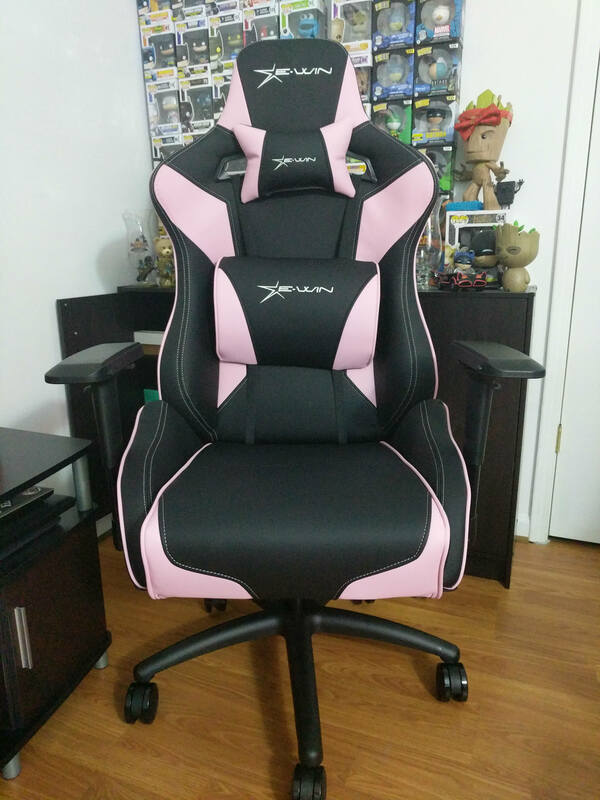 The chair of my choice that they sent over to me was pink and black. Yes I know, you’re asking why did I choose pink and black? Simple answer is that I have a red and black gaming chair, a blue and black gaming chair, a white and black gaming chair and a yellow and black gaming chair. I don’t really care for green or orange too much so I figured, why not, let’s do something different and unexpected. So not upset with my decision either as the chair is actually really nice looking. Assembly of the chair takes about 20 minutes, if that, and inside the box comes all of the tools you need, which is basically just a set of Allen keys. Like the other chairs I’ve put together, EWin Racing makes it super simple to assemble these chairs in a matter of minutes. For me I always put the casters on the base first. Simply because it’s the quickest thing to get done. All it takes is snapping each of the five casters into the five holes on the bottom of the base itself. Takes about 30 seconds total and there are no tools needed for this part. The second part I usually tend to assemble is the height adjustment bracket which goes on the bottom of the seat itself. Make sure you look at the bracket as one end of it will say Front in big letters, and that side needs to face towards the front of the seat so that you can operate it properly. There are 4 washers and 4 lock washers that go on each of the 4 bolts. Then simply line up the holes in the bracket to those in the bottom of the chair and screw all four bolts into the chair as tightly as possible using the included Allen key. Once that is done, then the most difficult part of the entire process is ready to be done. That’s assembling the back of the chair to the base of the chair. Simply slide the back of the chair between the two brackets on each side of the seat of the chair and again fasten it with the 4 bolts, washers and lock washers that are included. Total time for this can take about 5 – 10 minutes as getting these holes lined up can be the tricky part, at least for me. At this point the chair is ready for you to sit in and start using. However, there are two pillow type cushions that are optional for you to install and use. One is the head rest pillow and it simply slides over the top of the chair itself. The second is a back support pillow that sits right where the seat and the back of the chair meet. It comes with two long straps that buckle together in the middle. Simply run the straps through on of the holes near the top of the chair, down the back and through the slot where the seat and back of the chair are. Buckle them together and you’re good to go. According to EWin Racing, the gaming chair has a reclining spec of 85 – 155 degrees, however I was able to lean the chair almost a complete 180, which was somewhat stable but not recommended at all in my opinion. So like they say, don’t attempt at this home or it won’t end up pretty. As I stated early on above, this chair looked amazingly big when I was pulling it all out of the box in the various pieces before assembly. Once assembled, the chair was still very large in size and again it almost looked as if it were going to be a bit too large for me personally. However, once assembled and put to use for a couple of hours or so, I realized that while the Flash XL Series is a bit larger in size compared to my other gaming style chairs from OPSeat, DXRacer and Vertagear, it’s actually very comfortable and quite nice to have the chair a bit larger. There are some really good selling points to the EWin Racing Flash XL Series gaming chair that beat all of the others. First is the armrests and I touched on this in my OPSeat review. For me, while I like the moving armrests where they go up/down, left/right and front to back, on the DXRacer they were very annoying. The Vertagear didn’t do all of that with the armrests so there was no comparison. The OPSeat chair was much better than the DXRacer was about this, but the EWin Racing chair blows them all away. The Flash XL Series chair does all three movements, up/down, left/right and front/back but it also does side to side. Unlike with the OPSeat and the DXRacer, all but the left/right require you to press/hold a button. That way when you lock the armrest into place it stays there. This was the issue especially with the DXRacer as it is super simple to swivel the armrests left and right and it was very annoying. The EWin Racing makes having these options a complete pleasure and not an annoyance in any way. Throw in the fact that you can slide the EWin Racing armrests left and right is a neat little feature and added bonus as well. The armrests in general are pretty well padded and comfortable especially for someone like myself who tens to lean on one armrest(the left) more than anything. It’s a plastic/rubber type armrest that is much better than the DXRacer and Vertagear and again is just one more reason why I prefer it over the others. Sitting in the chair is an absolute pleasure as well. The one thing I absolutely hated about the Vertagear chair was how hard the seat cushion was. So bad that I had to buy a cushioned pillow from Amazon to be able to use the Vertagear for more than an hour or so. The EWin Racing chair is very well cushioned and very comfortable and without a doubt the best of the best so far. For me, the EWin Racing gaming chair is my all time favorite of the four different brands I’ve had to date and I honestly feel it’s going to be quite a long time before anything makes me feel or think differently. As is the case with most of these types of chairs, it’s a bit on the pricey side of things, as the Flash XL Series will run you $429, but there are different styles that you can get for around $249 – $279. This of course is the biggest chair they offer which is why it’s a bit more expensive. Totally worth every penny as I spend a ton of hours each day in my chair, both doing email work for my job and playing my favorite video games. I find at the end of the day my back or legs or anything else don’t hurt and I can do it all again the next day. NOTE: This is a review post from Techdissected.